I have been doing some research into the state of the economy. My 2014 observation remains in force — this is a robust recovery, but one that is lumpy and unevenly distributed. However, I continue to be astonished at the various data points I have found that support that bifurcated recovery thesis. The Financial Times had a giant “Legacy of Lehman Brothers” column (see chart above). Their conclusion is the GFC left behind a global pensions mess. “The evidence from the US is alarming. The US has a much less generous social safety net than western Europe or Japan, and a much stronger tradition of private investment. Americans should, therefore, be more likely than others to make good long-term investment decisions. But collectively, they do not. Most Americans with DC plans do not have anything like enough money saved to support them in retirement. 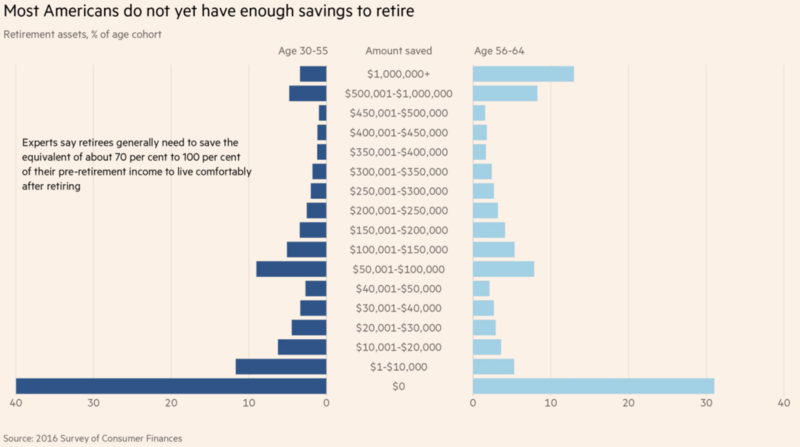 1 in 3 Americans has exactly zero dollars saved for retirement. But not to worry, legal weed and blockchain will make sure they — and medicare and social security — are solvent in 30 years . . .